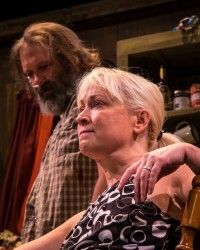 Theatre22 mounts a sensitive and touching production of the one-act play Annapurna featuring two local talents: John Q. Smith and Teri Lazzara. Sharr White’s work debuted in LA in 2014 and has already had a Broadway run starring Ned Offerman and Megan Mullally. White writes of a long separated couple coming to terms with their individual pasts and each other. Hard truths are faced, old disputes are replayed, new fears arise and yet a grudging love and respect somehow emerge by the final blackout. The two-person piece is skillfully performed and deftly directed by Julie Beckman. Smith plays Ulysses, and like his literary namesake he has been away from Emma his wife for twenty long years. He is a cowboy poet who has set up a ramshackle home in a large RV out in the wilds of Colorado at the base of a mountain range. Emma plows into his life with a quite a bit of baggage, both figuratively and literally. She has just escaped another failed marriage to warn Ulysses that their son will soon arrive looking to reunite with his long absent dad. The boy is enraged that he never got to see a huge batch of letters dad had written years ago and he blames Emma who sadly, never knew that they had existed. The work begins with a number of short cutesy blackouts as the ex-husband and wife spar over what kind of mess Ulysses has made of his home and his life. The play’s tone grows more somber and genuine when Ulysses realizes that Emma has experienced her own set of sorrows since their separation. Both actors bring an impressive natural acting style that wears wonderfully for the duration of the play. These two characters have very little to prove to each other or themselves. Their quiet resignation in the late stages of their relationship lends itself to moments of dramatic truth telling. Most importantly they must come to terms with a terrifying event that precipitated the end of their marriage. The relating of that story is dramatically forestalled until late in the play. The title Annapurna refers to both an epic poem Ulysses is working on and a formidable mountain range in the Himalayas nearly impossible to conquer. Ulysses and Emma realize that though those kinds of ambitious challenges may be in their rearview mirror, life still has more than enough tests in store for them. The play concerns itself with how they intend to meet those tests, together or alone. Michael Mowery is responsible for the unique set design, turning the entire proscenium into an old-fashioned RV. Jennifer Ewing is the scenic artist responsible for the beautiful mountain range lying just outside Ulysses’ windows.